Is SYNC Transportation Security Administration compliant? Please visit www.tsa.gov for more information on regulations related to traveling with CBD products. How is our oil is extracted? Utilizing an Organic Ethanol Wash.
Will I get high from taking SYNC? No. SYNC does not contain THC. What is the benefit of SYNC being Water Soluble? True water-solubility means a quicker uptake into the bloodstream as well as a much higher rate of absorption. What does it mean SYNC is 100% Bioavailable? Bioavailable speaks to the ease of absorption into the bloodstream. Since SYNC is truly a water-soluble product, it offers up to 100% absorption. This absorption rate varies from person to person, dependent upon their own body. How is the oil extracted from SYNC? Is SYNC a Full Spectrum or Isolate? 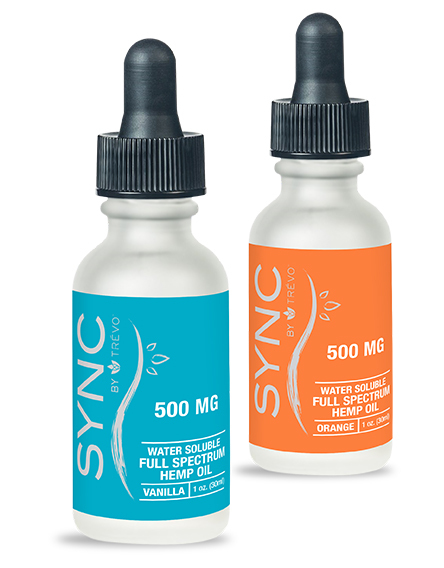 SYNC is a full-spectrum hemp oil product. 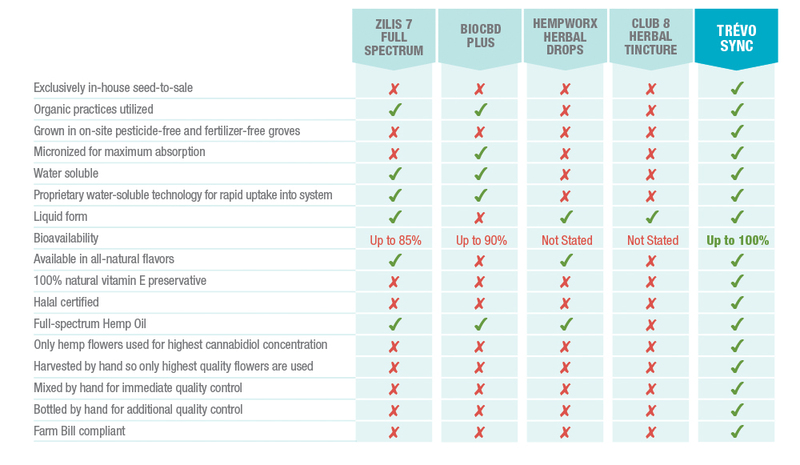 What is the difference between a Full Spectrum Hemp Oil Vs A CBD isolate? The extraction process determines whether the active Cannabidiol compound is removed from the plant as an “isolate” or as a “full-spectrum” oil. Full-spectrum hemp oil, on the other hand, contains other active compounds in addition to Cannabidiol. Will SYNC make me tired or give me lots of energy? It will neither make you feel tired nor give you lots of energy. It contains no stimulants that cause jitters or excessive energy, but does contain a number of very beneficial vitamins, minerals and phytonutrients that promote overall good health. Can SYNC interact with other pharmaceutical drugs? That is a subject that is best addressed by your health care provider. Can you explain the difference between CBD marijuana oil, Hemp oil and Hemp seed Oil? Basically, cannabis is an umbrella term that includes both hemp and marijuana plants. Cannabis sativa is the scientific name of the cannabis plant (Cannabis = genus; sativa = species), and hemp and marijuana are just two different strains of it. (One could correctly refer to a “marijuana” or “hemp” plant as a “cannabis” plant, for example, but you would not refer to a “marijuana” plant as a “hemp” plant, or vice-versa). Hemp seed oil is extracted from the seeds of the hemp plant typically using a cold-press process. This type of oil can actually be extracted from all plants in the cannabis genus, but only industrial hemp is used in production. Industrial hemp is used primarily because they have been specifically bred for seed and stalk. Hemp seed oil can be used as a substitute for olive oil and other cooking oils in various recipes and in salad dressings. Full-spectrum hemp oil contains all of the compounds contained in the hemp plant. CBD oil contains only the Cannabidiol compound. It is important to note that the full array of hemp compounds offer a variety of vitamins, minerals and other phytonutrients that work together synergistically, making full-spectrum hemp the best choice for optimum good health. What is the benefit of taking a CBD oil daily vs taking as needed? In order to obtain the best results, it is necessary to get a sufficient amount of Cannabidiol oil or full-spectrum hemp oil on board in your system. Simply taking it when you feel it would help may give you some benefits, but not nearly as much as taking it as recommended (twice daily). Is this available for retail? SYNC is available for retail sale through Trévo’s Life and Health Coaches. Can I add this to a meal replacement? Is this FDA approved if no why not? The FDA does not approve any dietary supplement, including SYNC. The manufacturing facilities are under subject to the oversight of the FDA, but the FDA does not, and never has, reviewed and/or approved dietary supplements. Is it external or internal use? SYNC is intended to be ingested. Can this be taken on an empty stomach? Where does SYNC come from? SYNC is produced using Colorado-grown agricultural hemp grown using organic farming methods. Can I have this at work? That depends on the employer. If you are in a state which has legalized the sale of cannibidiol or hemp oil containing cannibidiol, then there should be no issues but, again, it may depend upon the employer. No. SYNC is not medical marijuana, which has shown some benefits in managing epilepsy. Can a pregnant women take this? As with any dietary supplement, pregnant women should check with their health care provider before taking SYNC. Can you take this while driving heavy machinery? Yes. As stated earlier, SYNC contains absolutely no THC and will never make you feel “high” or drowsy. What if I take more than recommended dosage, what happens? Since it is not possible to “overdose” on SYNC, there are no ill effects from taking more than the recommended amount. Will this make you hallucinate? No. There is absolutely no THC in SYNC, so it cannot make you “high”. Why is it illegal in five states? Those five states have not yet passed legislation legalizing the sale of Cannabidiol or hemp oil containing Cannabidiol. Is there any THC in SYNC? What happens if I get pulled over with SYNC? SYNC is a completely legal product in all but five states, and it will not be sold in those five states until they pass legislation legalizing the sale of Cannabidiol or hemp oil containing Cannabidiol. So, the answer is that absolutely nothing will happen if you are pulled over with SYNC. Is SYNC legal to take? Is this a natural product? Yes, SYNC is 100% natural. The hemp is grown using organic practices, the flavorings are natural and even the preservative (vitamin E) is natural. Can this be taken with Trévo or other supplements? SYNC interacts well with Trévo so, yes, it can be taken in conjunction with Trévo. There are no indications that there are any limitations or concerns regarding taking full-spectrum hemp oil with other dietary supplements. However, if you have any concerns, we recommend that you speak with your health care provider. SYNC is a full-spectrum agricultural hemp oil product that is highly bio-available due to its proprietary water-soluble technology. It is available in either natural vanilla flavor or natural orange. How does CBD oil interact with other medications? Will SYNC make me fail a drug test? No. 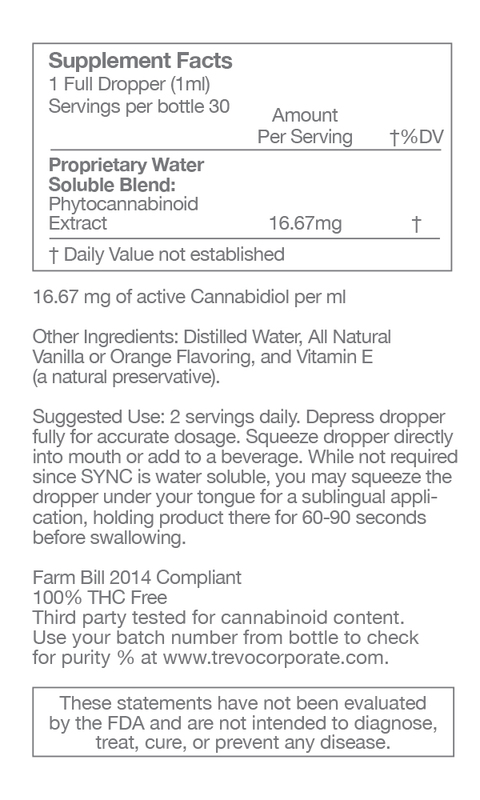 According to our manufacturer, SYNC contains absolutely zero THC. How do I know if CBD oil is best for me? The best way to determine if you will benefit from CBD or hemp oil is to try SYNC. Use it twice daily as recommended for 30 days and then assess how you feel. Of course, if you currently take any prescription medications, we recommend that you check with your health care provider before taking SYNC or any other dietary supplement. CBD is the 3-letter abbreviation for Cannabidiol oil. Cannabidiol is one of the dozens of natural compounds found in the hemp plant.